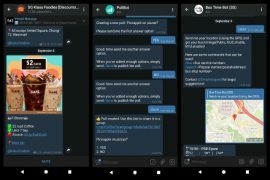 We don’t know about you, but when it comes to traveling, we usually filter our choices by “Lowest Price” to avoid the expensive ones and try to find a hotel room with a good combination of amenities and value. But way, way, way up shoestring, and budget travel is the megarich travel where price isn’t even a factor. It’s the type of travel that happens with expensive hotels, private jets, chauffeurs and probably lots of Dom Pérignon. Naturally, this level of travel requires a certain type of accommodation where one can actually live the Crazy Rich Asians life for a whopping $100,000 SGD +/- per night stay. 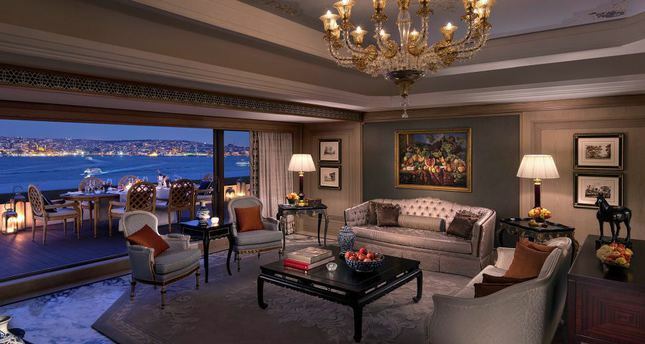 Perched right at the top floor of the Shangri-La Bosphorus in Istanbul occupies the Shangri-La Suite that is worth $40,000+/- night. The 3,940 square feet suite is nothing short of lavish, as it offers 2 bedrooms with separate dining and living rooms that are elegantly furnished in the finest details. Each bedroom and the living room takes you to a private terrace with panoramic views of the Bosphorus Strait. And you will definitely not be disappointed with its spacious marble-clad bathrooms that are seriously embellished with Bvlgari toiletries and a 19-inch TV embedded in the vanity mirror. Set along the stunning Bodrum coast that overlooks the Aegean Sea, The Palace suite at Jumeirah Bodrum Palace in Bodrum is a sight to behold. At your beck and call, you are entitled to various amenities and services including 24-hour private butlers, 24-hour room service, a multi-lingual concierge team, laundry and dry cleaning, shoe shine, in-room dining, DVD and PlayStation game hire. So just sit back, relax, and luxuriate yourself in the gold-plated surroundings of the room or by the private beach. 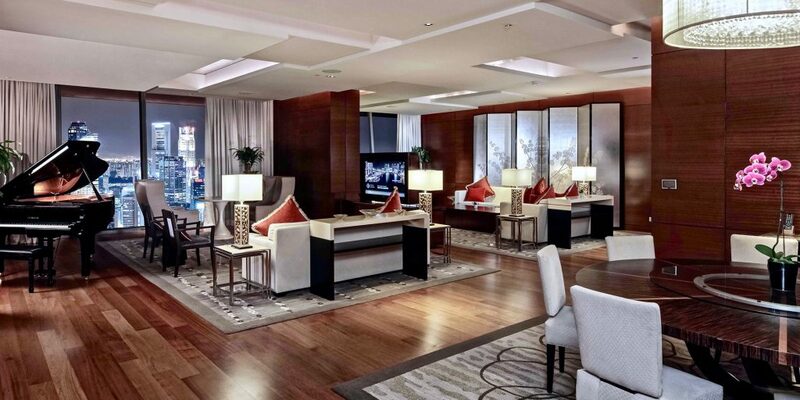 At 7,000 square feet, the Presidential Suite at the InterContinental Hong Kong hotel is the largest suite in the city. 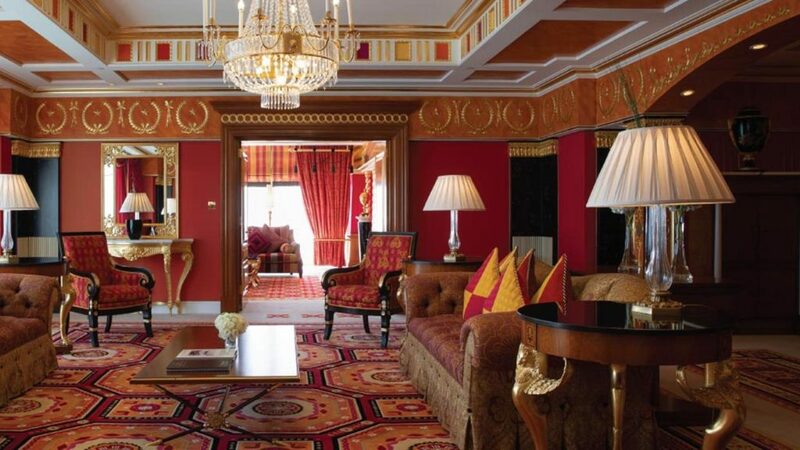 Also recognised as Asia’s most spectacular Presidential Suite, it will cost you $17,000/ night. It will be an experience like never before, as you stumble upon the 2,500 square feet outdoor terrace with a private infinity swimming pool offering magnificent views of Victoria Harbour and Hong Kong Island. Inside the suite, 5 bedrooms along with a dining room, private study, kitchenette, and private gym await your enjoyment. At $17,000+/- night, you can push open the doors of the Chairman Suite on the uppermost floors of Marina Bay Sands to claim that you had the most luxurious hotel experience in Singapore. The 6,500 square feet interior space offers 4 bedrooms, 3 furnished balconies, 2 living rooms including 1 with a baby grand piano. Included in your stay, there are complimentary breakfast, complimentary massage, 24-hour butler service, as well as an in-suite private bartender. To land yourself in Sydney’s most expensive hotel room, that’s $18,000+/- night. For that price, you get to have an unparalleled experience with the distinguished Sydney Opera House and the most beautiful harbours in the world right on your doorstep. A look inside the 3,800 square feet luxurious suite, you will be invited with a mesmerising sight of the two massive bedrooms as well as the multiple balconies. To top it off, the bathrooms are equipped with the latest technology, including in-built music, seat warmer and massager. 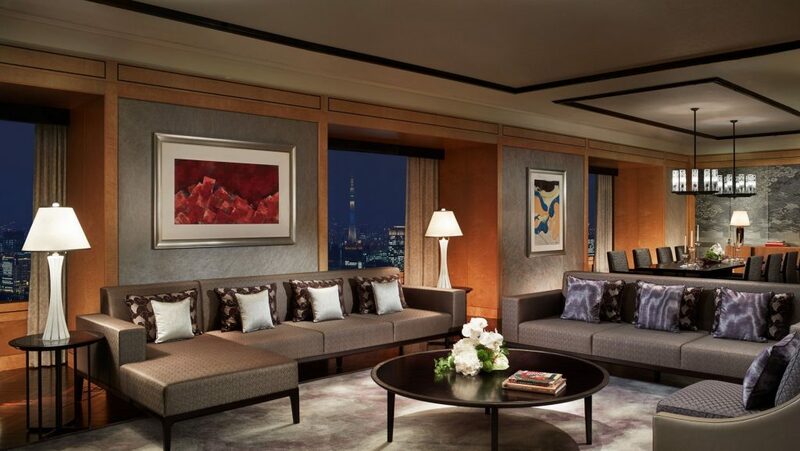 With a night’s stay amounting to $25,000+/-, The Ritz-Carlton suite at The Ritz-Carlton in Tokyo is one of the most extravagant hotel suites in the world. At a soaring location on the 53 floor, you can’t miss the spectacular view of Tokyo skyline, including the Imperial Palace garden. The inside is breathtaking too: At 3,300 square feet, the suite is a huge living space. You get to have two luxurious bathrooms, connected living room and dining rooms with pantry, as well as a spacious Walk-in closet. 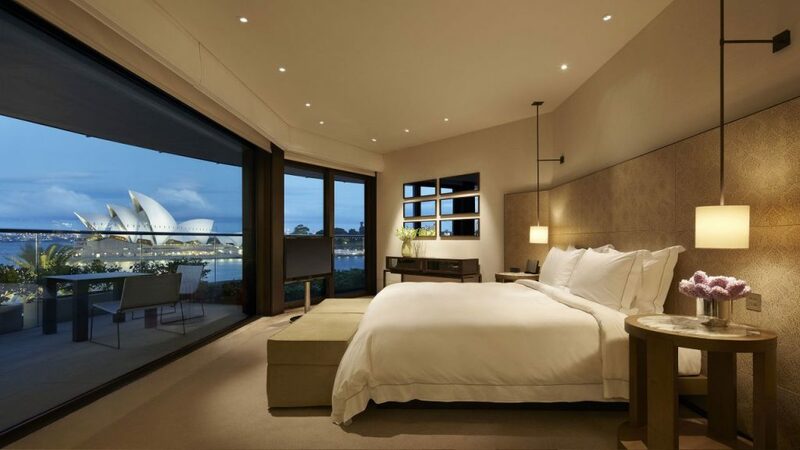 Joining the ranks of Australia’s most expensive hotel suites is undeniably the Chairman’s Villa at the Crown Towers hotel in Perth. You will know that you have arrived at the lavish suite when you are immediately gawked by the lofty double-height lounge with private bar, as well as the towering windows and the cantilevered balcony that luxuriates you with sweeping views of the city’s skyline and the distinguished Swan River. Designed by award-winning interior architect, Michael Fiebrich, the 8,600 square feet suite features 4 lavish bedrooms, a private gym and massage room, study room and billiard room over two-stories. This is crazily the most expensive hotel in Asia at a daily rate of $27,000+/-. 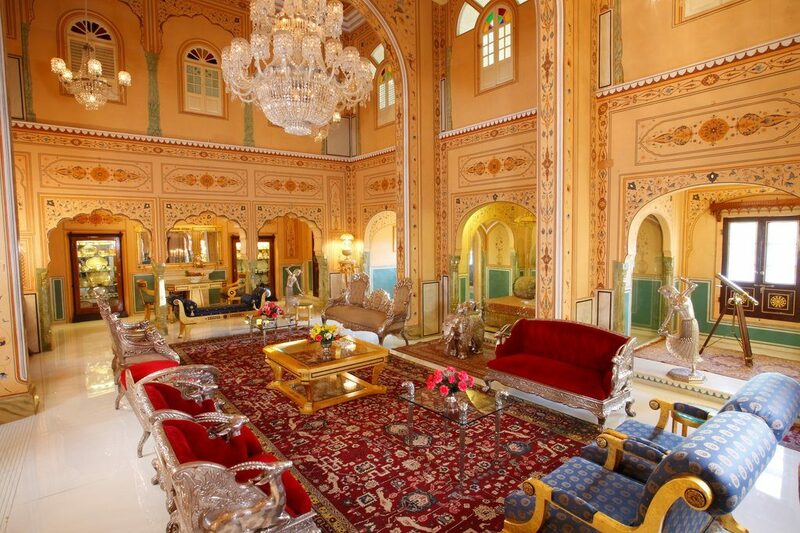 You will live pretty much like royalty if you check yourself into the Presidential Suite at the The Raj Palace in Jaipur. 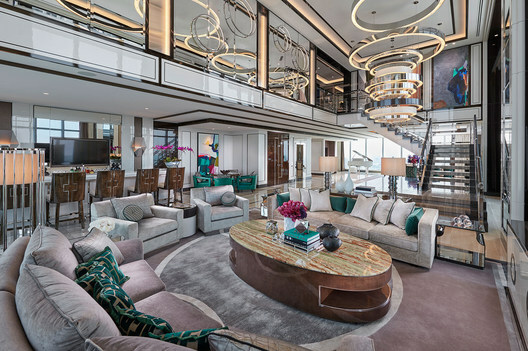 The palatial four-storey suite will provide you with 16,000 square feet of space, along with a private lift that connects all four floors. Heads-up here: don’t be shocked if you see a private museum inside the suite. Yes! It’s a museum celebrating India’s rich heritage of the Old Throne and Bolsters of The Thakur Sahib (king or Maharajah). 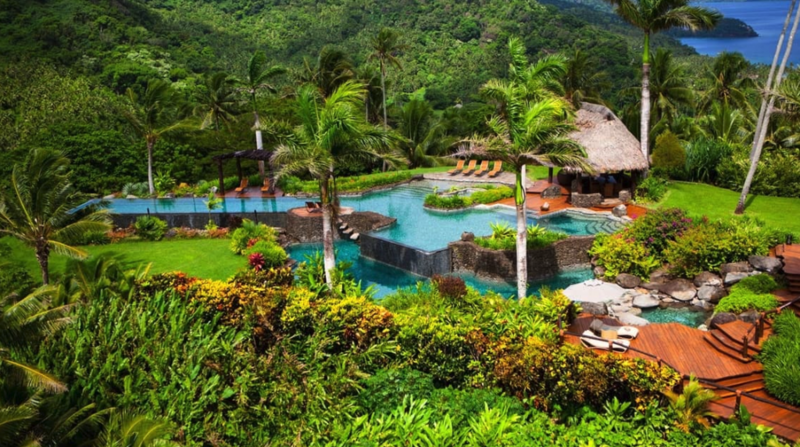 To step foot in the Delana Hilltop Estate at the Laucala Island Resort in Fiji involves no cheap way. Totally reserved for the super-rich, you will need to have enough savings to stay for at least 4 nights at $35,000+/- night. That’s a total bill of $140,000. 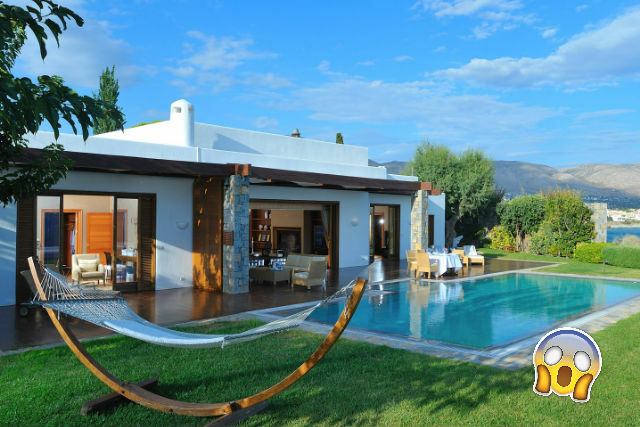 Moreover, not just anybody can have a living experience at this prestigious estate. Preapproval via an application from the owner, Dietrick Mateschitz, is required. 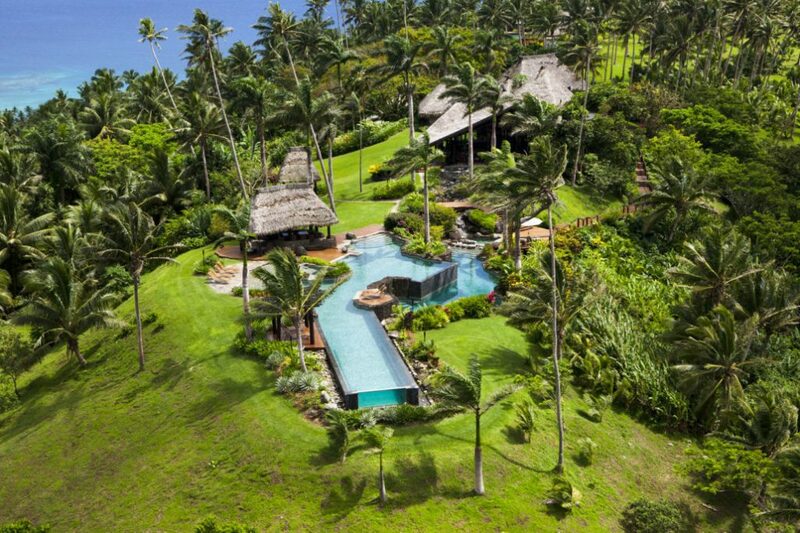 The estate provides an exclusive resort island getaway, with 20,000 square feet of bedroom space, your own chauffeur, cook, nanny, swimming pool, as well as the most breathtaking, panoramic view of the entire island. Splash out $35,000+/- night, and you get to push open the hand-carved doors and be awestruck by the beautiful white and blue-themed interior of the finest penthouse suite at The Connaught hotel in London. As you take in the rare views of your private dining room, a spacious wraparound balcony, double-height ceilings and a beautiful feature fireplace in the suite, you will definitely want to move in full-time from the moment you enter the suite. Standing tall in modern Dubai, the most expensive room at the Burj Al Arab Jumeirah in Dubai is worth $40,000+/- night. Perched on the 25th floor, the two-storey Royal Two-Bedroom Suite is one of a kind. At the bottom floor, you will be welcomed with your own private dining area for 12 along with a personal butler who will be available for 24-hours, as well as an exquisite majlis style lounge. The top level of the ultra-luxurious suite provides you with two master bathrooms complete with a full-size Jacuzzi and a separate five-head rain shower, as well as a set of his and hers full-size Hermes amenities. And here’s a surprise: there’s a library and a cinema room! Find yourself in the biggest and the most expensive hotel suite when you check in the Royal Suite at the Hotel Plaza Athénée in Paris. For $35,000+/- night, you can also have the best view of the Eiffel Tower in the City of Light. 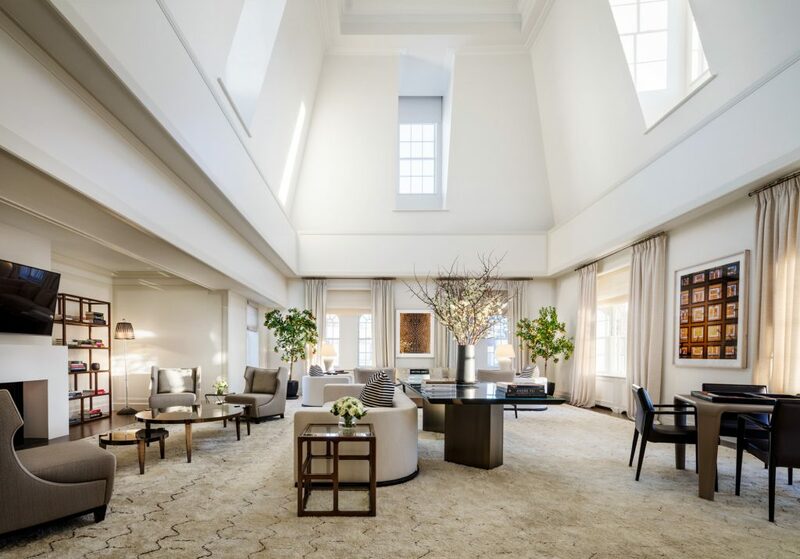 Designed by world-renowned interior designer, Marie-José Pommereau, the suite tops the list as the most spacious and luxurious suite with its 4,850 square feet space, featuring four bedrooms, four bathrooms, two drawing rooms, an office and a separate kitchen. The room is fitted with furnitures dating back from Louis XV and Louis XVI periods, and includes state-of-the-art facilities such as flat-screen, full HD televisions concealed within mirrors, a steam room and Jacuzzi. 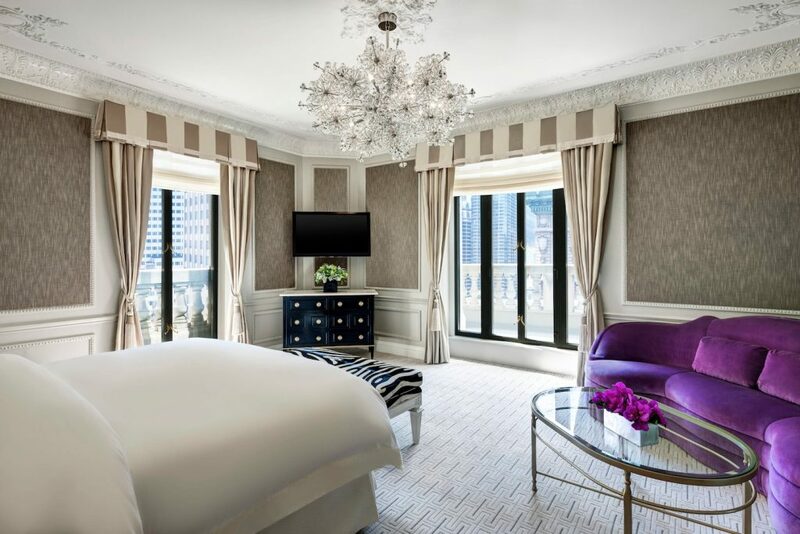 In the same luxury stratosphere, the Presidential Suite at The St. Regis in New York offers a grand space of 3,000-3,430 square feet with three bedrooms and four full bathrooms at the approximate price of $40,000+/- night. You will soon find out why so many people burn a hole in their wallet for the comfort of this gorgeous suite. Its floor-to-ceiling windows offers a spectacular 360-degree view of the beautiful city as well as Central Park. Also, don’t be surprised if you find a library inside the room. Unlike any other, you can live like a Las Vegas king if you can afford to fork out $40,000+/- night for the Sky Villa suite at the Palms Casino Resort in Las Vegas. Located on the 32nd floor, the two-story features a grand 8,500 square feet of space with soaring ceiling heights. It comes with two bedrooms, two luxurious lounges, and media areas that can accommodate up to 52 guests, a 17-seat bar, private glass elevator, glass-encased pool, terraces, massage and fitness rooms, and around-the-clock butler service. A stay in the most expensive hotel suite in Italy will cost you $40,000+/- night. 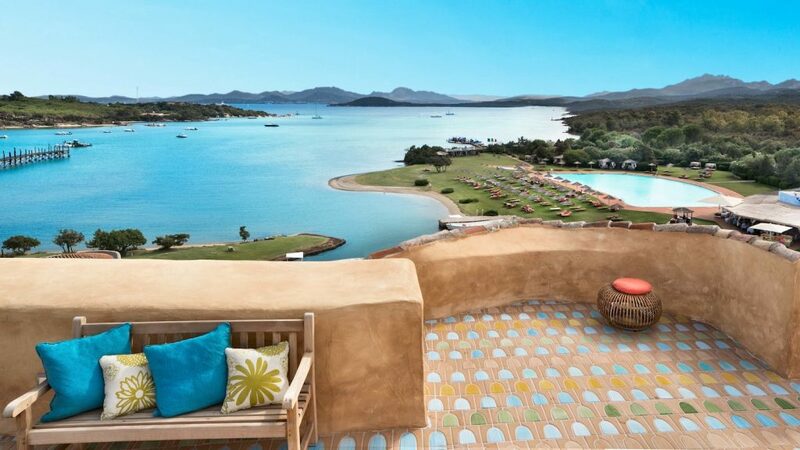 This is none other than the Penthouse Suite at the Hotel Cala di Volpe in Costa Smeralda. The multi-level 5,400 square feet suite is the ideal location if you are one who appreciates a minimalist interior décor. With three bedrooms, three bathrooms with Jacuzzi, two living rooms, a solarium, and a large terrace, a fitness area and the ultimate indulgence of a private swimming pool, the lavish suite is worth the nightly price tag. Address: 57 East 57th Street, New York, New York 10022 USA. 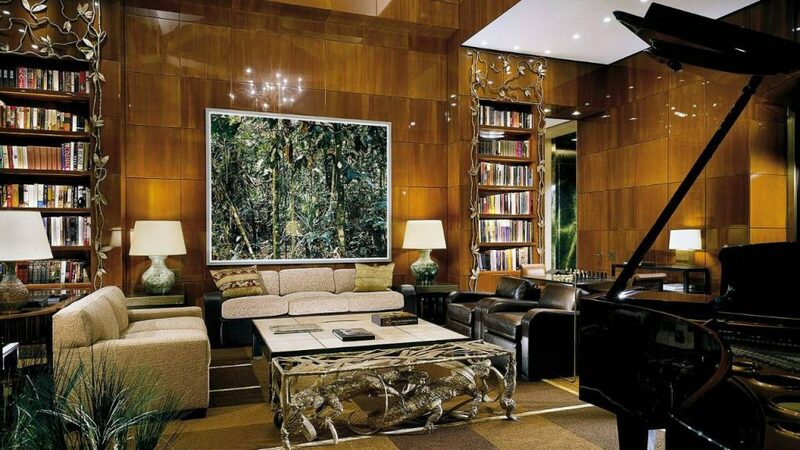 Want to stay at the most expensive hotel suite in New York? Then you will need to save up $80,000+/- to stay there for one night. It’s definitely worth the experience, as you get to be chauffeured around with a Rolls Royce courtesy car, be personally styled by Christian Dior, and enjoy Bvlgari amenities. If that’s not enough, the suite that also comes with floor to ceiling windows allows you to have panoramic views of New York City. At a glance, you will be able to see the Chrysler Building, downtown skyline, the East River and the Atlantic Ocean. Inside the $55,000+/- night Penthouse Suite at the Hôtel Martinez in Cannes, the opulent room is huge, dazzling and outrageously lavish. 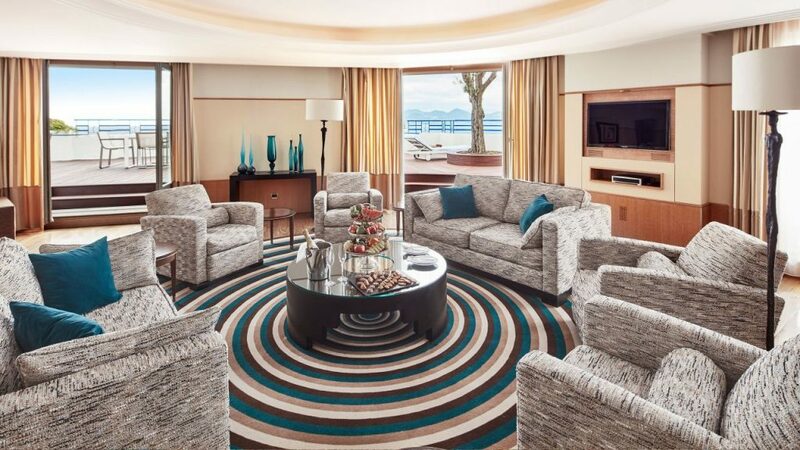 At the highest level, the prestigious suite boasts a space of 2,000 square feet, in addition to a 1,600 square feet private terrace providing breathtaking views of the Bay of Cannes, the Boulevard de la Croisette, and the hotel’s private beach. Adorning the walls of the four-bedroom penthouse are the artworks of Picasso and Matisse. Get a taste of the luxurious life of the crazy rich if you are willing to drop a year’s salary on a single night in a luxury suite. 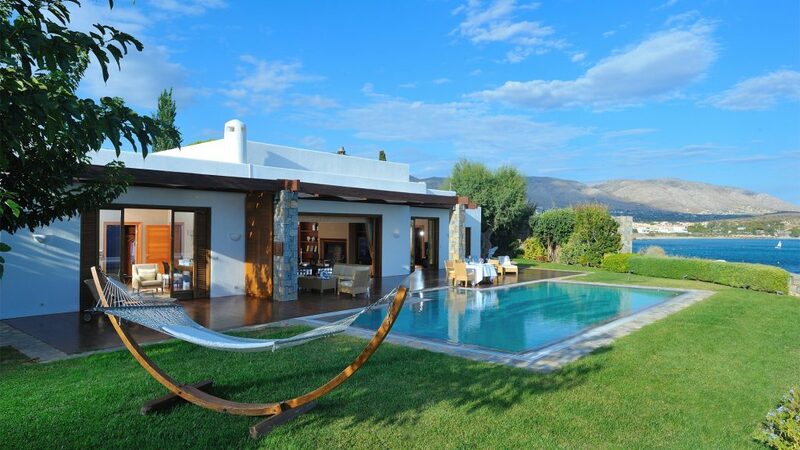 Worth $70,000+/- night, The Royal Villa at the Grand Resort Lagonissi in Athens features two master bedrooms, an indoor and an outdoor heated pool, a private garden, massage area, as well as path leading to the beach. You also get your own butler, chef, personal trainer, pianist, as well as limousine and helicopter service. With a price tag of $100,000+/- night, The Mark Penthouse is now the most expensive and the largest hotel suite in the USA. The unprecedentedly spacious penthouse is the definition of opulence as it showcases 5 bedrooms, 4 fireplaces, 6 bathrooms, 2 powder rooms, and 2 wet bars over 2 floors. Want a full-sized Grand Ballroom? The more than 10,000 square feet living room that also boasts 26-foot ceilings can be easily transformed into one, allowing you to host up to 24 friends. Further into the 2,500 square feet rooftop terrace, you can overlook Central Park, the Metropolitan Museum of Art and beyond. 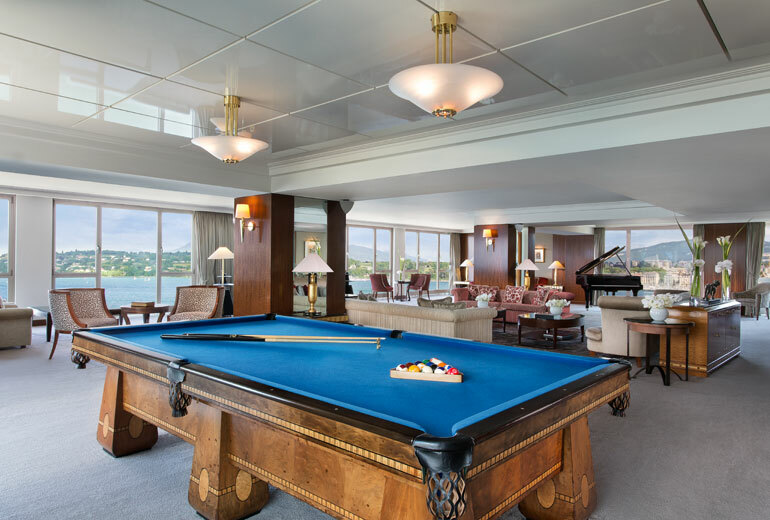 Priced at $80,000+/- night, the Royal Penthouse Suite at the Hotel President Wilson in Geneva, Switzerland is the most expensive hotel suite in the world. The suite consisting of bulletproof windows for maximum security, as well as Hermès amenities and a Steinway grand piano at your disposal, has hosted multiple celebrities around the world. They include Michael Jackson, Richard Branson, Rihanna, Bill Gates, Matt Damon and Michael Douglas. With 12 bedrooms, the good news is that you can split the cost among your crazily rich friends for this exclusive experience. To stay at this top-of-the-island nest, you will need approval and the will to pay the $75,000+/- a night with a minimum of four nights stay! The palatial retreat boats over 120 thousand square feet of space which include guest residences, a panoramic swimming pool, private cook, chauffeur, nanny and the opportunity to scuba dive, hike or learn to ride horses. If you could live at any of the mentioned hotels, which will it be? Let us know in the comments below! *TNC Applies. 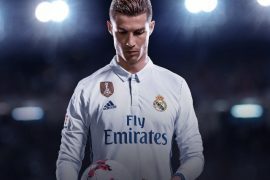 Valid for new users from 5 to 12 Nov only.